Gmail and Yahoo mail limit the message size. The size of files that can be sent via some of the most popular mailing services is of about 25MB. While you can mostly send files that do not exceed the message size it becomes a very tedious process when a file greater than 25MB needs to be sent. The attachments can not be read and although the files can be compressed, but still even that is not helpful every time. 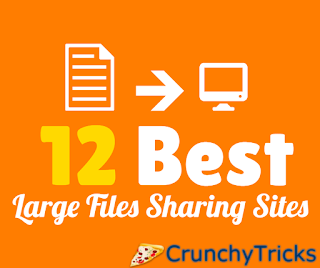 But there are few websites that allows one to share files with greater size over the Internet. These allow an easy and secure way for the transfer of large files. Apart from websites, some Softwares are also available for this purpose. Some of the websites are discussed in the article below. These provide an efficient way of data transfer and information exchange. The websites discussed below provide services free of cost. This website allows both regular and secure way of data transfer. One can send files up to 5 GB through the regular mode. It is free of cost and does not even require registration. Just enter the e-mail id of the receiver and that of the sender along with a message (this feature is optional) and attach the file. Registered users enjoy more facilities, they get up to 20GB of free of cost cloud storage and can attach any number and size of the file, that can be sent to an unlimited number of recipients. The site also provides an app for the ease of the users. One can store,share and collaborate their work easily using pCloud. An app for Android devices, iOS devices, and a pCloud Drive is also available. The website provides a simple interface for transferring files and documents up to 2 GB. One simply needs to add files to be sent, the mail address of the receiver and that of sender along with a simple message. This is a user-friendly website, paid accounts can also be created at We Transfer plus that provide additional services, a greater range of file size and data transmission. It allows attachment size of around 20 GB, also facilitating personalization and formation of personal URLs. The transfers remain password protected and a data of around 100 GB can be stored in the cloud. The payment plan is friendly with around 12$/month or a saving of around 17% at annual subscription. Allows transmission of all types of files including JPEGs, PFS, MP3s and others. The free service supports data transmission of 8GB provided with 256-bit AES Security, and there is no requirement of downloading any software. Simply mention the email ids of receivers and sender along with an optional subject and message, select your file and send it easily. A DropSend app is also available for android and iOS phones, DropSend can also be used through PCs, MACs and can be easily integrated with Outlook. It is an effective way to send store and collaborate data with complete authorization of the user. It is a fast and reliable way of large file exchange which is easy to use, intuitive and provides a secured communication by the use of advanced encryption technologies. By creating an account the user can send up to 20GB of attachments to multiple users at a single time until a limit of 30 GB is reached after this the services provided by this website become paid. One can also participate in a live chat and customize their branding as well as download pages to create a consistent user experience. Widgets can be used to receive files on one's sites or blogs. The site also facilitates transmission of HD videos via iPhones, an anytime, anywhere use cloud service and sends a notification when the recipients download files. It allows one to bypass the limits provided by the email service provider. A file of size 20GB can be sent at once with a maximum of 5 files at a time using the web application. It provides a secure transmission of files by 256-bit SSL encryption and files are stored on the cloud by 256-bit AES encryption technology. The receiver receives a link containing the attachment of file. The business services have greater facilities and also provide a 2 week trial period for the customers. One can opt for the free service too,this does not require any registration. The application allows easy, reliable and safe data sharing at anytime anywhere. It is free of charge service that requires registration for all users. A user can send high-quality video or large packages. The application also allows one to save packages directly to the cloud storage system and allows the creation of customized FTP with transparency in incoming and outgoing files. Files can be sent to multiple users at a single time a list is maintained of the sent and received packages. MyAirBridge has an A+ rating in terms of security authorized by a global authority. A package can be easily sent to another user without downloading it and can be stored on the cloud directly. It also provides easy contact management. It provides a robust managed file transfer service along with data security and privacy regulations. It is an effective way of transmission of large and sensitive data, modeled to serve all the needs of a user. The registration does not require any credit cards or money. No need for software installation, no limits to file size. Simply log in through your mail address and confirm your id and password to enjoy the service for an unlimited span of time. The comprehensive security is based on 128-bit encryption. This is another platform for easy and reliable transfer of large files, the free of charge service includes unlimited downloads and delivery tracking of incoming and outgoing messages along with BitTorrent downloads and FTP downloads, the maximum limit of downloading available in this plan is of 30GB. The site also provides apps and plug-ins for smarter work and to boost productivity this also integrates the use of fill email at all platforms. It provides HTTPS secure transfer and branding of email and the web for better customer interaction. It provides quick and successful file transfer accomplished with three easy steps. It is a convenient way of file transfer along with great speed and efficiency. It does not require any secure codes or registration for this purpose. One can select any file type: videos, photos, CAD or PowerPoint presentations. And can add any number of files as there is no limit to the file uploading box. The site provides easy and comfortable data transfer. Each file which is uploaded can be of a maximum 5GB size and any number of files can be added. The site does not require login or sign-up and provides free storage service as well. The website provides one to rise against all size limitation for sending and receiving attachments and offers s relief against complicated FTP setup and account management. Permits users to transfer files through firewalls and routers. It allows users to send files up to 100 MB for free and provides a free online file storage plan, a user can send about 6 files at once without any requirement of a registration, for tracking of secure files it also notifies users after delivery of messages. One can easily access the service through Outlook, AOL, Hotmail, Gmail and Yahoo. The progress bar shows the percentage complete, elapsed time, left time and speed of data transmission. The servers are secured and well managed with firewall and intrusion detection system. It offers to send email or download link for the attachment. One can send files without registration and these will be deleted automatically after 7 days. The free and the basic plan does not provide the users with this service, the user has to delete the file manually. In the basic plan, the users can optionally also protect messages with passwords and add an expiration date after which the file will automatically be moved to trash. The maximum file size allowed is 1 GB, simply add your email address, the ids of receivers and upload files to start the transfer. It is an easy to use, reliable and secure means of communication of large files. This is a tool that seems easy for both sides looking out for large file transfers. It provides easy customization with options to add background images of choice and complete branding, 5 GB transfer is allowed in the basic package that includes files of all types – HD videos, photographs, design files, and others. The paid version allows the customer to enjoy a 20 GB online storage. A file history is maintained containing all details of the files sent since the beginning of your service. On can create their custom website and unique domain for example you.filestofriends.com. There is a free trial available for 14 days that allows you to experience all the services. So here we comes to an end. Give them a try and let me know your best experience. woah! Exhaustive list! I have tried pCloud,wetransfer and yes kanssfer is also good, if you want you can also add http:www.kanssfer.com to your list!